Sylvania Christmas LED Candle, Orange Flicker Flame, Battery-Operated, White/Brass, 9-In., 4-Pk. 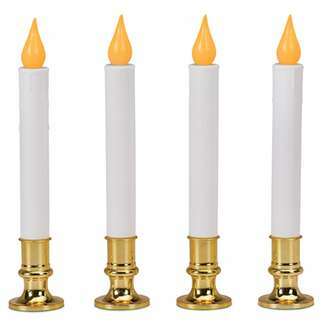 Sylvania, 4 pack, 9" battery operated flickering led candle, orange led, gold base, stays on 8 hours, turns off for 16. 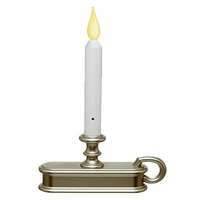 Requires 2 "aa" batteries, not included, lasts up to 50 days with 1 set of batteries. 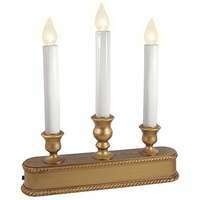 Christmas LED 3-Light Candolier, Battery-Operated, Gold, 10-In.